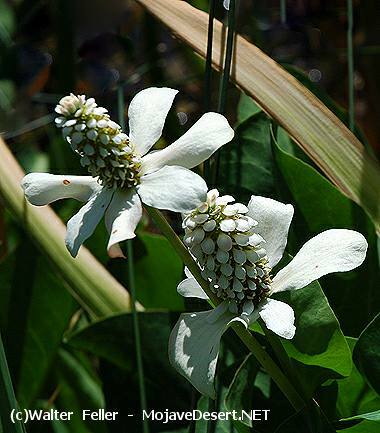 Ethnobotanic: The root of the plant was used as a medicine by many tribes in California, Great Basin, and the Southwest including the Wukchumni Yokuts, Kawaiisu, Paiute, Shoshone, and Pima. Some Native Americans still gather the plant today. The Kawaiisu, for example, boiled the root and a decoction was then drunk hot to alleviate colds and coughing. The Tubatulabal of southern California for colds also took a decoction of the plant. The Kamia of Imperial Valley pulverized the seeds of yerba mansa in the mortar and the meal was then cooked as mush in a pot or baked as bread in hot ashes. The Yokuts pounded up the root and soaked it in water. The water was then drunk for a bad stomach. The Costanoan made a decoction from the root, which was used, for menstrual cramps and for general pain remedy. A tea was used to wash sores and the plant, dried and powdered, was sprinkled on wounds as a disinfectant. The Cahuilla peeled, cut up, squeezed, and boiled the roots into a decoction that was drank as a cure for pleurisy. An infusion was also used as a cure for stomach ulcers, chest congestion, and colds. The bark was also harvested in autumn and boiled into a deep red-wine color and drank to alleviate ulcers or applied externally to wash open sores. The Moapa Paiute boiled the leaves in a quantity of water and used it as a bath for muscular pains and for sore feet. The Shoshone mashed the roots and boiled them to make a poultice for swellings, or the decoctions used as an antiseptic wash. A tea from the boiled roots can be taken for stomachache or more commonly as a tonic for general debility following colds. The Pima in the Southwest made an infusion of dried roots which was taken for colds. They also chewed the roots and swallowed them or made a decoction of the roots which was taken for coughs. Spanish settlers in California used the plant as a liniment for skin troubles and as a tea for disorders of the blood. This plant is not valued horticulturally, yet its white bracts are quite attractive. This plant is hardy and spreads rapidly, and can become invasive. Start the plant from a fleshy root. Dig up the plants from an already established area and transplant them in the fall or winter. Directly outplant the plants in the ground in full sun, giving them plenty of space. Place the plants one-foot apart. The transplants will fill in quickly, sending 2-3 feet of runners radiating out from each plant. Water the transplants and keep them moist year round. If growing the plants for their roots for medicinal purposes, plant them in a loose soil. Weed around the plants periodically. Areas of yerba mansa were burned periodically by the Wukchumni Yokuts to maintain their quality and abundance. Cultivars, Improved and Selected Materials (and area of origin) ANCA is available from native plant nurseries within its range. Bean L.J. & K.S. Saubel. 1972. Temalpakh: Cahuilla Indian knowledge and usage of plants. Malki Museum Press, Morongo Indian Reservation, Banning, CA. Bocek, B.R. 1984. Ethnobotany of Costanoan Indians, California, based on collections by John P. Harrington. Economic Botany 38(2):240-255. Chalfant, W.A. 1933. The story of Inyo. 229 p.
Curtin, L.S.M. 1949. By the prophet of the earth. San Vicente Foundation, Santa Fe, New Mexico. Franco, H. 1993. That place needs a good fire. News From Native California 7(2):17-19. Jepson, W.L. 1925. A manual of the flowering plants of California. University of California Press. Berkeley, California. Kaul, R.B. 1986. Saururaceae. p. 79 IN: Flora of the Great Plains. R.L. McGregor, T.M. Barkley, R.E. Brooks, E.K. Schofield (eds). University Press of Kansas, Lawrence, Kansas. McClintock, E. 1993. Saururaceae. pp. 1000-1002 IN: The Jepson Manual: Higher Plants of California. J.C. Hickman (ed.). University of California Press, Berkeley, California. Powers, S. 1976. Tribes of California. University of California Press, Berkeley, California. p. 480. Train, P., J.R. Henrichs & W.A. Archer 1957. Contributions toward a Flora of Nevada No. 45. USDA, ARS, Plant Industry Station Beltsville, Maryland. Train, P., J.R. Henrichs, & W.A. Archer 1941. Medicinal uses of plants by Indian tribes of Nevada. Contributions Toward a Flora of Nevada No. 33. USDA, The Division of Plant Exploration and Introduction, Bureau of Plant Industry, Washington D.C.
USDA, NRCS 1999. The PLANTS database. National Plant Data Center, Baton Rouge, Louisiana. . Version: 990405. Voegelin, E.W. 1938. Tubatulabal ethnography. Anthropological Records 2(1):1-84.